December 29, 2012 by rwb, under Microcontroller. One of the basic usage of the TIMER peripheral on every microcontroller is to provide the accurate timing mechanism. Using the TIMER peripheral as the basic timing, we could easily develop a stopwatch and display it to the 8-Digit seven segment numeric LED display. 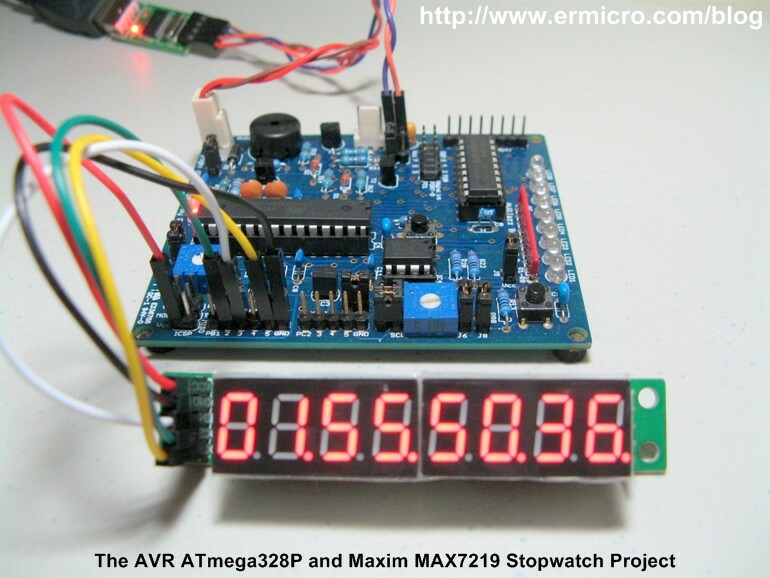 Thanks to the Maxim MAX7219 chip which enable us to interface this 8-Digit seven segment LED display much easier using just three wires of the SPI (serial peripheral interface) to display the hour, minute, second, and hundredth of seconds to the 8-Digit seven segments LED display. 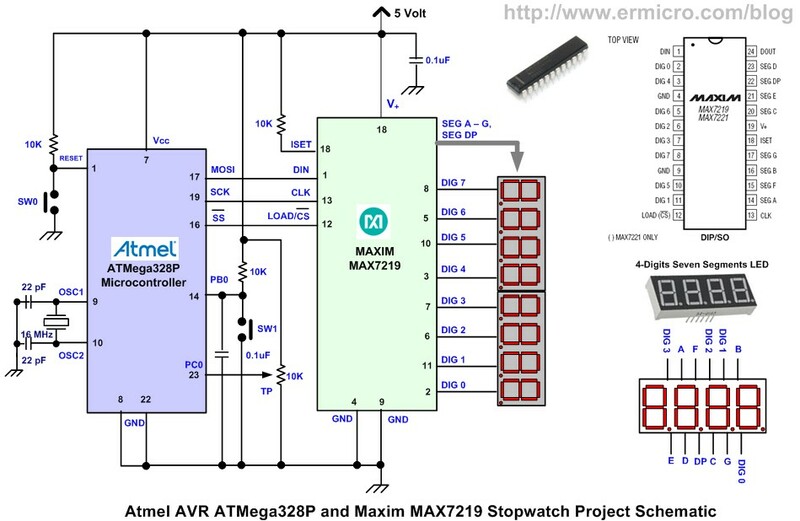 On this tutorial we will learn to utilize the Atmel AVR ATMega328P microcontroller SPI peripheral to communicate with the Maxim MAX7219 chip. The AVR ATmega328P SPI peripheral will be configured as a master and Maxim MAX7219 as the SPI device slave; you could read more about the SPI in Using Serial Peripheral Interface (SPI) Master and Slave with Atmel AVR Microcontroller project on this blog. A simplified electronic schematic of this project is shown in this following picture. 5. AVRJazz 28PIN development board from ermicro which is based on the AVR ATmega328P microcontroller. Adjust the intensity of the 8-Digits seven segment LED display using the trimmer potentiometer (TP). Reset the stopwatch counting by pressing the SW0. The MAX7219 chip from maxim is a powerful serial input/output common-cathode display driver that interfaces microcontroller to 7-segment numeric LED displays of up to 8 digits. It has a build-in BCD (binary code decimal) decoder and a brightness control. Although the main function is to drive the 8-Digits seven segment LED display but because it also capable to drive an individual LED segment i.e. segment A to segment G and DP (decimal point), therefore you could also use this chip to drive the individual LED, the LED bar-graph, or the 8×8 LED matrix display. 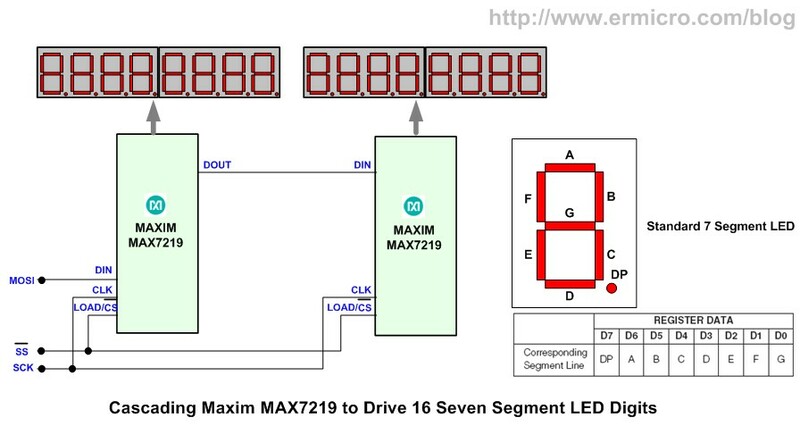 The MAX7219 could easily be daisy-chained (cascaded) to another MAX7219 chip using the DOUT pin which is useful when you want to drive 16-Digits LED display or several LED matrix display. 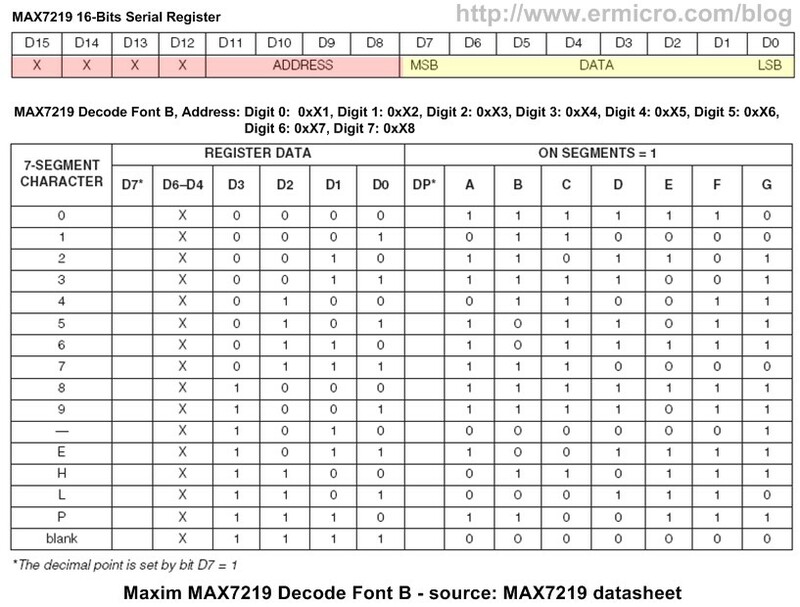 The MAX7219 chip has 16-bit registers divided into two sections; the first upper byte (bit 8 to 15) is called the address and the lower byte (bit 0 to 7) is called the data. In order to send a command to the MAX7219 chip, first we need send the 8-bits address and next we send the 8-bits data. For example if we want to display a character 6 (six) on digit 0, then first we send the address 0x01 to select the digit 0 and next we send the value 0x06 to the MAX7219 16-bits register. The same principle is also apply to other important MAX7219 chip commands such as activate from the shutdown mode (normal operation), use BCD decode (font B) mode, scanning limit (scanning digit 0 to 7), and adjusting the seven segment LED digit intensity please refer to the Maxim MAX7219 datasheet for the complete explanation. The 16-bits TIMER1 peripheral is the heart beat of this stopwatch project. We used this 16-bit TIMER1 as it give more flexibility to implement the stopwatch, because of the 16-bit counter length, therefore it could counting up to 65.536 before overflow. We will use TIMER1 16-bit output compare register OCR1A (OCR1AH – OCR1AL) as the base of our hundredth of seconds counter. The hundredth of seconds = 20000 x 0.0000005 seconds = 0.01 seconds. Noticed inside this interrupt routine we also run the disp_digit() function which is used to send the command to the MAX7219 chip to display the corresponding digit but in order to reduce the overall execution time inside the interrupt routine we only display the changed digit at the time. Both of these interrupt type has a common used, which is to generate an interrupt based on any signal change on the particular I/O ports. The external interrupt request has more flexible digital input type event but limited only on two I/O ports PD2 and PD3, while the pin change interrupt request has only one type event i.e. logical change, but it could be applied to all the ATmega328P microcontroller I/O ports. By setting the PCINT0 bit in pin change interrupt mask 0 register (PCMSK0) we activate the PB0 I/O port as the pin change interrupt source. Next we enable the PCIE0 bit in pin change interrupt control register (PCICR) and global interrupt to enable the interrupt. When the pin change interrupt occur on PB0 we simply assign and examine the keystate variable. After system reset (pressing SW0), pressing the SW1 will activate the TIMER1 output compare match A interrupt. Next when we press the SW1 i.e. keystate variable is equal to 2, the disp_digit() function will simply return to the caller function( i.e. 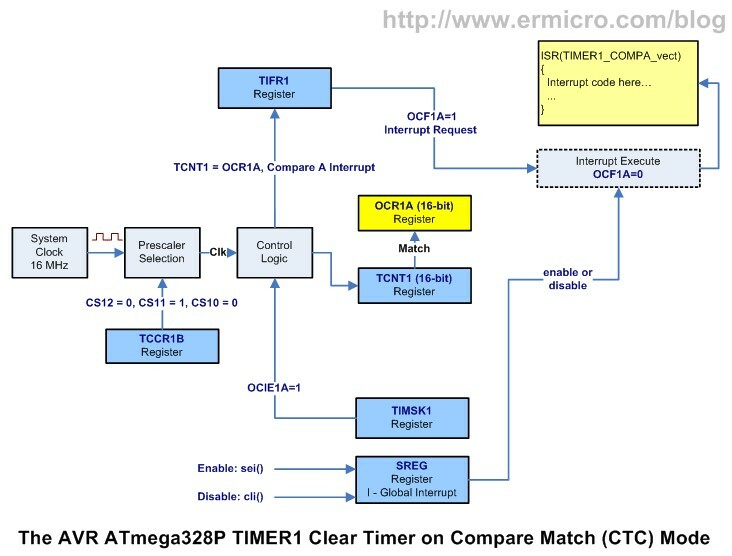 the TIMER1 compare match A interrupt) without sending any new display information to the MAX7219 chip. This allows the stopwatch counter to keep count while freezing the 8-Digits seven segment LED display. The C code begin with initializing all the necessary ATmega328P microcontroller peripheral such as the TIMER1 peripheral, external interrupt peripheral, SPI peripheral, and the Analog to Digital Conversion (ADC) peripheral where we just use the 8-bit resolution (left adjust) as the MAX7219 intensity level is only have 16 steps i.e. 0 to 15, therefore we don’t need to use the 10-bits resolution of the ATmega328P ADC peripheral. 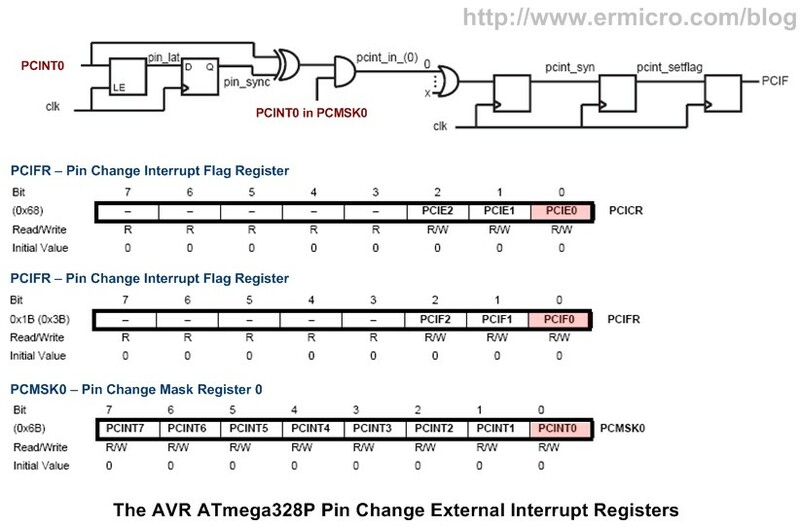 For more information about using the ATmega328P microcontroller ADC you could read Analog to Digital Converter AVR C Programming articles on this blog. Controlling the Motor is one of interesting topics in the embedded world especially for the robotics enthusiasts, on the next post we will learn the basic of motor electronic circuit as well as how to control it with microcontroller. Therefore don't miss it, stay tune on this blog ! Copyright © 2008-2019 By ermicro. Powered by Word Press.